Richard Knerr and Arthur Melin, co-owners of an enterprise called the Wham-o Manufacturing Company, had started making slingshots after World War II with less than $1,000 capital. In 1957 they had racked up their first big score with Frisbees, light plastic saucers which could be skimmed slowly through the air from one thrower to another. children rotated them on their hips. Back at Wham-o, Knerr and Melin went into production with wooden hoops. After twenty or so they stopped; they didn't like wood and wanted to experiment with plastics. In May they had what they wanted: three-foot hoops of gaudy polyethylene tubing which could be marketed at ninety-three cents each, representing a 16 percent gross profit. Wham-o's new toy was christened the hula hoop. Patenting the hoops was impossible and by Labor Day a dozen other firms were turning out imitations under other trademarks. Even so, by early September Wham-o had sold two million hula hoops for a net profit of over $300,000. Then adults started using them for calisthenics. Wham0's bookkeeper couldn't keep up with the production figures. Workers went into three shifts. Counting the copiers at home and abroad, hula hoop sales that autumn were reckoned in the tens of millions. So widespread was their use that European medical journals warned of injuries which might be sustained by enthusiasts. In Leiden, Holland, a Dutch woman was being wheeled into surgery for removal of her appendix when her physician found that what was really wrong with her was a torn abdominal muscle, the result of strenuous gyrations inside a hoop. In England, where a quarter-million hulas had been sold, the British Medical Association cautioned, "No one with a known heart disease should try it, and anyone who is out of training should not go hard at it right away." Japanese emergency wards were filling up with hoopers suffering from slipped discs and dislocated backbones. 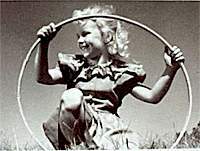 After a child was killed chasing a runaway hula the hoops were banned from Tokyo streets. Nevertheless sales there passed the three million mark. Lines of Japanese waiting to buy more stretched down the Ginza for blocks, and Premier Nobusuke Kishi received one as a gift on his sixty-second birthday. Queen Mother Zaine of Jordan, returning from a visit to Europe, included a hula in her luggage. That should have been a guarantee of respectability, but some toy makers were nervous just the same. One of hooping's attractions for adult spectators was its suggestiveness on some hips. An unexpected pleasure at football games that autumn was a view of winsome drum majorettes pumping their loins in a frenzy of excitement as thousands cheered. A French manufacturer of hoops, Jacques de Saint-Phalle, was afraid the church might notice and object. Saint-Phalle had a reputation to safeguard; in hoopless times he made his living manufacturing plastic tubing for hospitals and laboratories. To protect himself he persuaded French celebrities to be photographed hooping. Finland solved the same problem by staging marathons in which participants had to keep three hulas going, at the neck, hips, and knees. Elsewhere the American fad swept on, whatever watchers with coarse minds thought. In Germany it was popularized by the prizefighter Max Schmeling and his wife Anny Ondra. Germans who had no children, and therefore no easy explanation for buying toys, avoided embarrassment by having stores deliver them, wrapped, at night. A party of Belgian explorers leaving for the South Pole disclosed that twenty hoops were in their baggage; the expense was charged to morale. In some countries hoop shortages were serious. Correspondents in Johannesburg, where hulas were retailing at sixty-five cents, reported that only white customers could afford them; the natives were restless until charitable organizations started distributing free hoops. Het Vrije Volk of Amsterdam noted that Dutch industries requiring plastic tubing were at a standstill, and in Warsaw a weekly newspaper for young Poles observed, "If the Ministry of Light Industry and the Chamber of Artisans do not embark upon the production of hoops, we will be seriously delayed in hula hoop progress, especially on the international level." The ministry and the chamber continued to be dilatory, so hulas were smuggled in through East Germany. The craze receded as quickly as it had spread. By the summer of 1959 discarded hoops had begun to pile up in city dumps, but the rage had been a singular illustration of how great a grasp even the trivia of American mass culture had on the rest of the world.